Open Badges are wonderful and it was a brilliant idea to store metadata within a picture, but let’s face it, there is a time, in fact many of them, where designing a “pretty picture” to recognise one’s achievements or competencies is simply a waste of time or a hindrance — and the use of pre-digested graphics often an insult to our sense of aesthetics! We have now reached the situation where it is the tail wagging the dog: the “pretty picture” is the “need to have” in order to issue any credential in the happy world of Open Badges. No “pretty picture”, no credential! Does it have to be so? Moving the Open Badge movement from infancy to adulthood needs new metaphors and narratives — the badge for the girl and boy scouts. It is precisely what the blockchain technology is offering. The metaphor on which the blockchain narrative is constructed is the ledger, a word everybody can understand. And there is no reason to limit the entries of a ledger to represent Open Badges: the ledger is a faithful and trustworthy accounting of all our assets, and our assets are not limited to badges. Recording the evidence used to get credentials might be even more beneficial to an open credential process than the recording of the credentials themselves. In fact, the recording of evidence and associated endorsements (without having to issue a badge or a formal credential) might be just enough in many situations. Moving the recording of credentials from “pretty pictures” to a ledger would also benefit the fight against OBesity — a possible outcome to OB addiction! Once we are fully able to issue credentials without the need for a picture, we could then refocus our attention for Open Badges to things that really deserve a picture. But more importantly, moving credentials to a ledger would be an opportunity to establish the foundations for a better representation of human and social capital. By moving our focus from “pretty pictures” to a ledger, we might have a chance to establish a line of communication with human resource managers and the executive management. Are people an asset or a liability? For decades, accountants have categorised employees as a liability due to their salaries and future pensions. But in an era where more companies offer services instead of goods, and CEOs often talk about employees as their greatest asset, it is time for the 21st century ledger to match current rhetoric. […] Determining the actual value of this intangible asset is a difficult nut to crack. In 1978, 80% of a company’s value was easy to enumerate because it was mostly tangible assets such as factories and equipment. But now 80%of a company’s value is comprised of intangible assets such as brand value, intellectual property and, of course, people. How could this 21st century ledger look like? What elements should it take into account?For example, how could a company account for the benefits gained from the interaction of its employees with the people that are not on its payroll, like the members of the communities of practices where staff members find support to solve business problems and promote the image of their company? Brilliant system engineers can be dodgy social engineers! One could imagine that the people who came up with the concept of ledger for blockchains (or the other way around!) would have worked on some kind of 21st century ledger in the sense discussed in the article quoted above. Unfortunately, after doing a bit of research with Google on blockchains, human resource and human capital I must confess that I was not able to find anything worth reporting, except my surprise that conversations related to organisations in the “blockchain milieu” did not seem to show any interest for the human factor, or when they did, it was to place it on the liability side of the “ledger,” just like with a 19th century ledger! I felt like I was reading a sequel of “Player Piano”, the Kurt Vonnegut’s novel where human work is considered as the main source of non-quality! Brilliant system engineers can be dodgy social engineers! The lessons learned from the Open Badges experience could certainly benefit the design of that 21st century, blockchain-based, ledger! Another area that has not yet been explored is the use of Open Badges as a means to represent and value social capital — while Cities of Learning and the more recent LRNG initiative certainly contribute to the development of social capital, we are still far away from building any kind of representation of that social capital. Social capital is defined by the OECD as: “networks together with shared norms, values and understandings that facilitate co-operation within or among groups”. In this definition, we can think of networks as real-world links between groups or individuals. Think of networks of friends, family networks, networks of former colleagues, and so on. […] Put together, these networks and understandings engender trust and so enable people to work together. It is interesting to note that in the OECD definition, trust is the main engine for the creation of social capital. Is there a way to represent trust, and trust networks? Well, Open Badges are precisely a means to represent trust between an issuer and an earner, so the analysis of trust relationships through collections of Open Badges might be a solution. Yet, as we have seen, not every trust relationship needs to be represented by a “pretty picture.” For example, I can decide that I trust someone or an organisation for something specific (honesty, good cook, brilliant data scientist) without having to loose any time finding or designing a “pretty picture” to represent it. Trust is the engine and the currency of human and social capital. Personal Ledgers are a means to keep an accurate record of all personal assets: talents, competencies (skills, knowledge, attitudes and values) people, sharable resources, etc. Personal Ledgers are the building blocks for establishing a representation of human and social capital! Open Badge Passport and Personal Open Ledger. 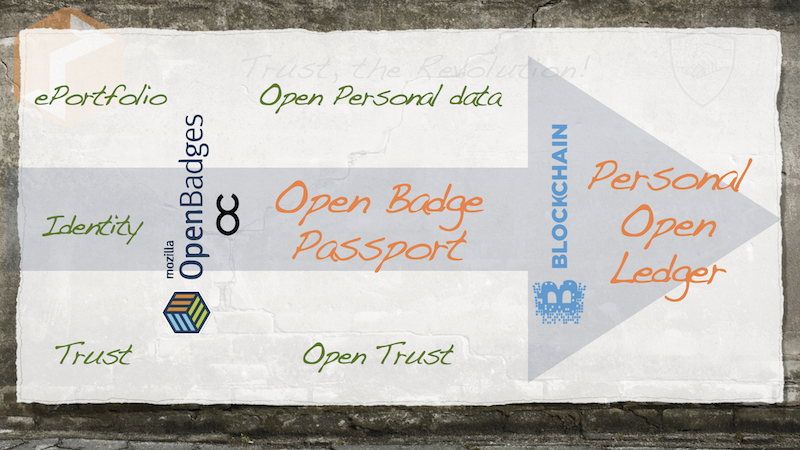 Moving the storage of Open Credentials (Open Badges being part of them) to a Personal Open Ledger is an extension of the original ideas behind the development of the Open Badge Passport, one of the laureates of the DML Trust Challenge. The Open Badge Passport enables the seamless sending, receipt, organisation, display, and search of digital badges. By establishing and nurturing networks of trust, it encourages the emergence of a new generation of services supporting learning, employment (including self-employment), social inclusion, and citizenship. By introducing the Personal Open Ledger as the means for storing one’s personal assets, of all types, not just Open Badges, the Open (Badge) Passport will act as a kind of Personal Assets manager. Moreover, as the participants in the Personal Open Ledgers / Open Passports ecosystem would be connected through trust bonds (credits and debts of Bitof Trust, BoT) we would have the foundations for achieving the building of a dynamic, ever changing bottom-up trust network, something that will be discussed in a following post. Originally published at www.learningfutures.eu on January 18, 2016.